For years, I have desired and prayed about a ladies' retreat at my parish. A retreat for women to getaway for a weekend, grow closer to Christ and enjoy fellowship with each other. I'm very, very excited to say that we are now finally in the planning stages for our first Catholic Ladies' Retreat for St. Angela Merici!!! We have organized a team of women who represent many of the different seasons of life for women in our parish and we've begun sharing our own experiences, brainstorming, praying and discussing. When discussing the package Catholic retreats that exist or those that we've attended, we decided to create one from the ground up to fit the identity of our parish. St. Angela Merici in Missouri City is still in the "young" stages of a parish, but no longer a small parish. Since our first mass in summer of 2008, we have grown to over 1300 households. It's been quite an explosion that means we no longer all know each other or even run into each other with four large masses in a weekend. The parish is "young" with lots and lots of children and families, but we want to target all the women in our parish with an inclusive event. We have stay at home moms, working moms, empty nesters, professional single women, divorced women, young adults, widowers, etc... But the one thing we all have in common - We are all called to be Daughters of God. 1. Create a women's retreat for all women in our parish, no matter their season in life or marital status. Everyone is welcome. 2. Create a place where women can meet Jesus and grow in their faith, even though we are all in different places on our faith journey. 3. Create a community where women can enjoy fellowship and connect with each other as daughters of God. Those are big goals to meet in a first year event. After going around and around with scripture and ideas for sessions we kept coming back to Daughters of God and Proverbs 31. At that point, many of the big pieces fell into place. 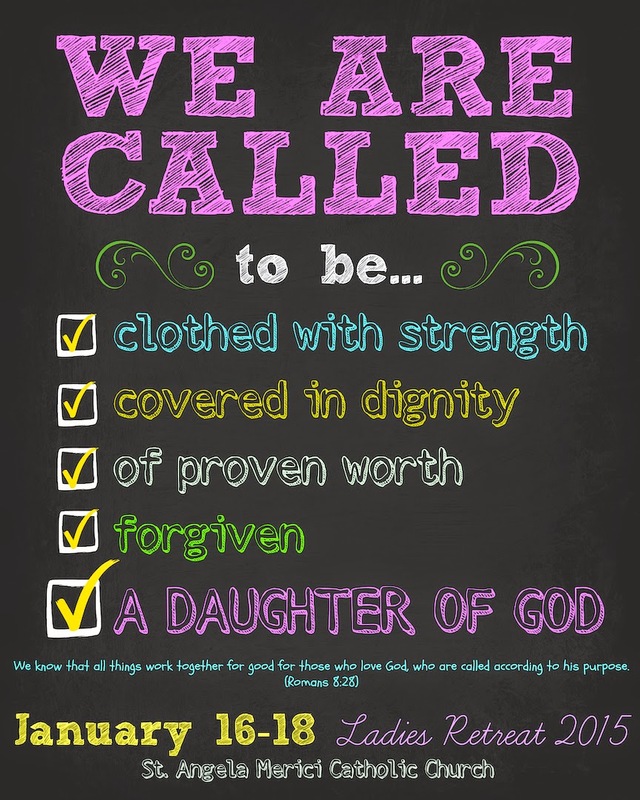 Our flyer and theme then naturally flowed from Proverbs 31 and the idea that We are Called to be a Daughter of God. We have a reservation at an archdiocesan retreat center, begun collecting emails from interested women and presented the retreat to the parish. Some of the big early stuff is done (or started), but now there are so many details to work through in order to schedule sessions, open registration and finalize plans. Would you share with us a few things about your retreat experience? If you haven't been on one, there are still a couple of questions to help us out. What is your favorite thing that happens at a weekend retreat? What type of swag (gifts, goodies) do you enjoy receiving at an event? Any favorite, must haves? What makes a retreat special for you? Do you have a favorite scripture verse or Saint quote that is great for women's groups? We are very excited and feel blessed to have this opportunity to bring the women of our parish together to grow as daughters of God. Will you pray for the Holy Spirit to guide our team in creating a retreat that brings the women of our parish together in community and closer to Jesus Christ? Thank you for your feedback! I've created a Pinterest Board for the retreat if you want to follow along with our planning. 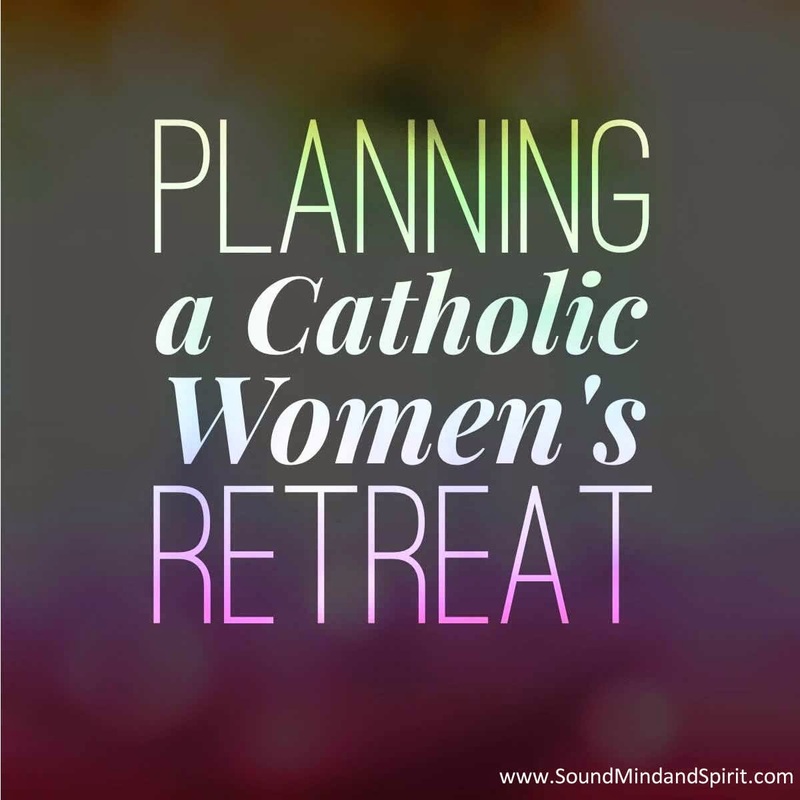 Follow Of Sound Mind & Spirit's board Catholic Women's Retreat on Pinterest. *Update* - Planning our first retreat was such hard work born out of love for God and our parish community that we wish to pay it forward to others wanting to plan a Catholic Women's Retreat. Our retreat team is currently working to put together our Catholic Women's Retreat plan into a .pdf format to share online. If you are interested in finding out more about the retreat resources and materials as they become available, please consider joining our email list below. We promise not to share the list or spam you. See other posts about Catholic Women's Retreat Here.